Product prices and availability are accurate as of 2019-04-21 17:50:13 EDT and are subject to change. Any price and availability information displayed on http://www.amazon.com/ at the time of purchase will apply to the purchase of this product. 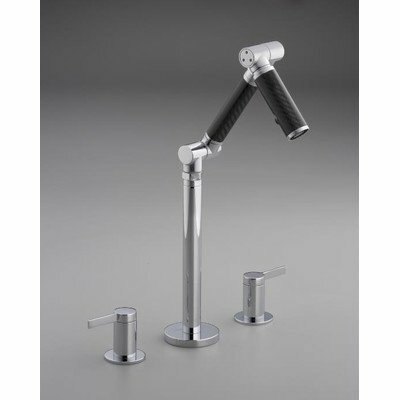 K-6274-C12-BN Finish: Vibrant Brushed Nickel Pictured in Polished Chrome Features: -Bathroom faucet.-Brass valve bodies.-Widespread.-Articulating spout.-Quarter turn washerless ceramic disc valves.-Flexible connections for easy installation.-Integral sprayhead.-Touch activated drain with tailpiece and overflow.-1.5 Gallon per minute maximum flow rate.-ADA compliant.-ASME A112.18.1 listed.-CSA certified.-ANSI A117.1 listed.-Watersense certified.-Spout reach: 2'' to 6''. Options: -Available in Vibrant Brushed Nickel or Polished Chrome finish. Construction: -Metal and carbon fiber construction. Dimensions: -Overall dimensions: 13.188'' H x 16'' W. Collection: -Karbon collection.